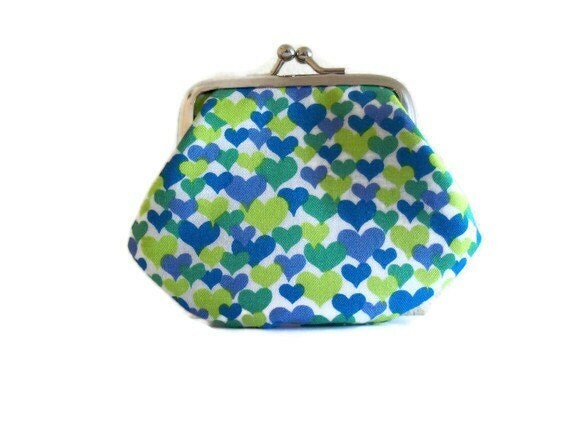 If you are looking for a small coin purse in bright fresh colours then this one is for you! Crafted in a fabulous cotton fabric with a hearts design....multi sized hearts in lime green, aqua green and 2 shades of blue on a crisp white background background. So if you are looking for the perfect little gift for a friend or ...yourself...then this pretty little purse is perfect. The perfect accessory for your handbag! There is a tradition that states new purses should never be given empty so your new purchase will come with a coin in it!! Purse measurements are: 11.5 cms across the widest point by 8.5cms deep.